The basic concepts of computer programming. 9 grade Informatics evaluation test. Computer science test. 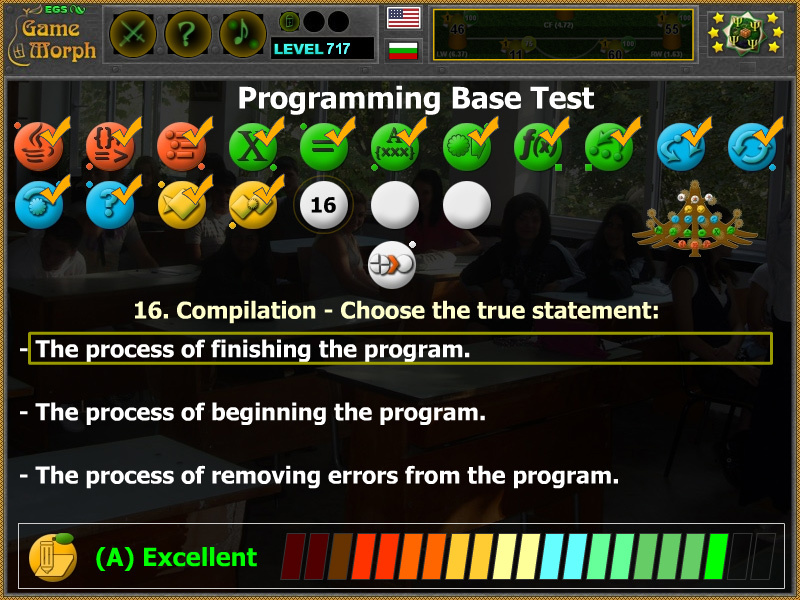 "Programming Base Test" is a free online knowledge level application, used for valuation. 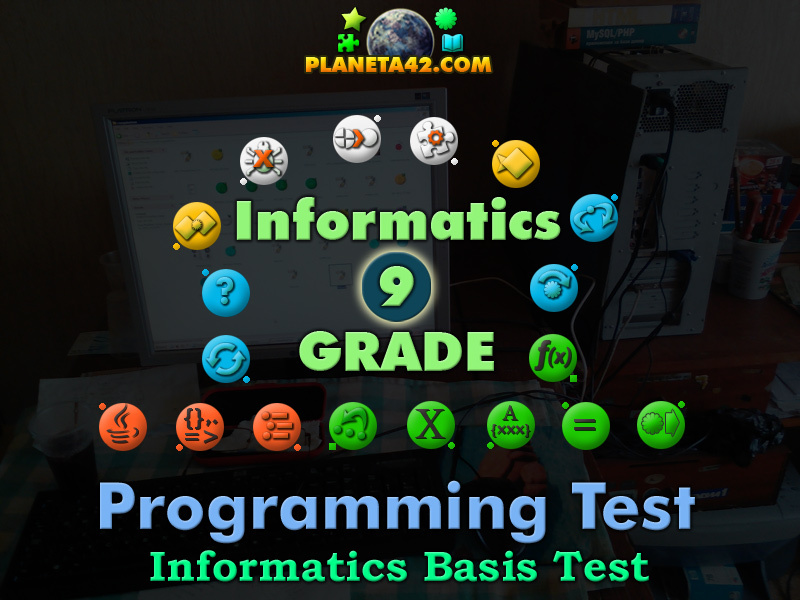 This test include questions about some basic concepts, notions, terms and tools, used in the process of computer programming, studied approx 9 grade Informatics. A small 18 steps interactive test for desktop computers, laptops and tablets, which may be solved online in the web browser. The IT Knowledge Board include integrated evaluation system. It is cumulative with the Programming Tree game. 9 grade Informatics classes for evaluation or theoretical lessons. How to play Programming Base Test. - There is only one Programming Language. - We need to choose a programming language and stick to it. - The programming language is not important. - All Programming Languages are the same. - The syntax is not important. - Every programming language, has its own syntax. - The Code is what we write to create a program. - The Code is what we get from the program. - The Code can not be seen. - Varialbles can not change their values. - Varialbles hold different values. - Varialbles hold many values. - The process of finishing a program. - The process of giving value to the variable. - The process of calling a variable. - Arrays can not change their values. - Arrays hold many values. - Subtraction is an Operation. - Transition is not an Operation. - Paste is an Operation. - Functions are only for advanced programmers. - The code can not exist without Functions. - Functions contain a set of operations. - Skipping part of the code. - Going ahead in a program. - Using a previous block of code. - Using RND - RANDOM to generate a random value. - Using IF - ELSE to define to where the program will go. - Using FOR - WHILE to make a repeating process. - Iteration is when two objects collide. - Iteration is the process of removing errors. - Iteration is one full stage of a cycle. - Objects can have their own codes. - Every language is object oriented. - Objects must be removed before compilation. - When two objects have the same X(position) value. - When two objects collide. - When two objects bounce. - The process of finishing the program. - The process of beginning the program. - The process of removing errors from the program. - Every software is a kind of program. - Every hardware is a kind of program. - Every peripheral device is a kind of program. Labels: Informatics Tests , Test Games , Flash Games , Online Tests , Education Games , Free Online Tests.